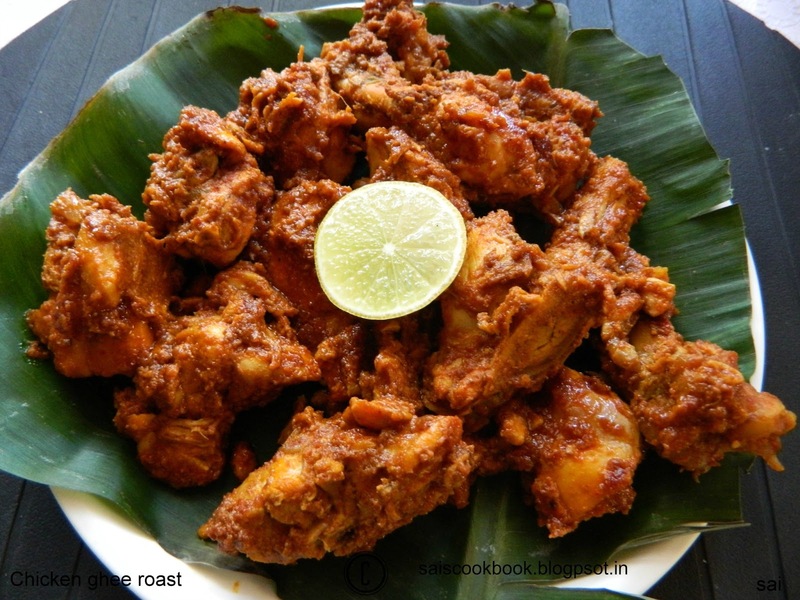 Chicken ghee roast is a favourite dish at our place.There are various recipes of this sizzling dish.This time I adapted this recipe from Kudpiraj’s Garam tawa .The original recipe was of Prawn ghee roast.The result was top.Received a thumbs up from my people.My son gorged it thoroughly.I had prepared prawn ghee roast long back,much before blogging. Marinate the chicken with the ingredients written under the same for 8-1 0 hours or overnight. Grind all the ingredients mentioned under “to be ground” to a smooth paste. Once the pressure releases,open the lid and keep it on high flame and dissolve all the stock. In a separate pan heat ghee and fry the ground masala until the raw smell disappears for atleast 10-15 minutes. Add the cooked chicken pieces and salt to taste and cook further in simmer for 5-7 minutes. Fry the ingredients marked as * in a tsp of oil,one by one until brown in colour. Roast the red chillies in 2 tbsp approx oil separately until crisp.